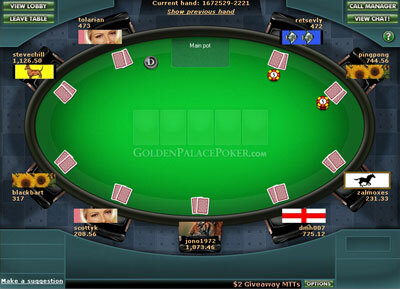 Golden Palace Poker has been a successful player in the online gambling industry since 1997. While their poker branch hasn't been around quite as long, it didn't take long to plump up their player base thanks to the familiar name they've built for themselves. Their unorthodox advertising methods (such as having streakers at the Super Bowl and putting temp tattoos on celebrity boxers) has given them plenty of players at the blackjack and the poker tables. Powered by Playtech, the software has a great look to it and the game play is fantastic. Fluid animations, crisp detailed graphics coupled with a user friendly, well designed interface make for easy, comfortable playing. Other features incorporated in the software include an option of making a "buddy" list of people you meet online that you would like to keep in contact with and the ability to make notes on players you play against so you can recall details of their playing style in the event that you play against them at a later date (handy when you're forgetful like us). There's a lot of good tournament poker action available at Golden Palace. Plenty of single and multi-table poker games are available including 6 and 9 player tables. Golden Palace Poker often hosts freeroll tournaments (tournaments with real prizes and no entry fees) as a way for new players to try tournament play. For frequent players, Golden Palace Poker has a great comp/rewards system; offering good ongoing promotions as well for repeat depositors. Customer service is excellent and well staffed. 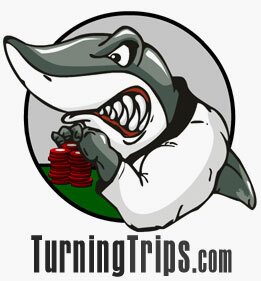 Offers a 25% bonus to new players on their first deposit.